>Lessons should always be short and should vary to keep the interest for both dog and handler. >When using verbal commands, they should always be the same. To help stop confusion of the dog/hound. >In all training, the tone of voice can do wonders. A high pitched happy tone can be used to praise and build the bond between hander and dog. >And at no point should a handler show frustration or that he/she has lost their temper as this will make the dog less likely to want to do the task again. >To train to track can start at any age, but like other training, the younger the better. 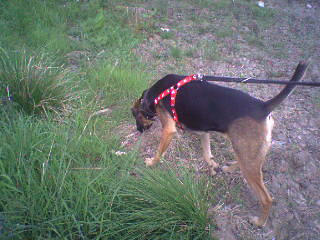 Tracking harness- a harness is advised as it doesn’t restrict the movement of neck and head. A line- this a long line normally between 10ft and 40ft, this is used to keep control of the hound but without getting in the way of it working. I recommend a glove for the handler, if your just starting out or not, once your dog understands it’s task it can travel at some pace. And if it pulls the line through your hands it cant give bad rope burns. Flags- Working trails and The ABB both use two flags. The bloodhound club use one. 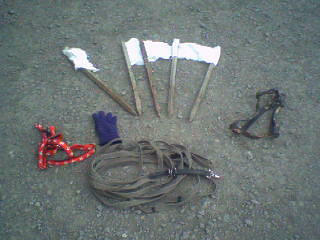 The first flag has had placed on it the scent article, normally a glove or a sock, than the second flag is used as a direction aid the only one the handler gets. In Bloodhounds they also train a hound to do what called a id, as once the hound has followed the scent the person needs to be identified. A id is when a hound “jumps” on to the person at the end of the line, but if the hound is senior or is too tired id’s can also include a head nudge. Or a sniff. But it is referred that the hound jumps on it’s target. The line walker, a person who is going to walk the line, normally for beginners it’s a member of the family or someone the dog knows. They set off with the two flags, one is put down at the start of the line than the walker walks about 10 steps and put the second flag into the ground, for beginners the hounds are allowed to watch the walker go off, a time is normally set before hand by the handler of which the walker is to walk for. Then the walk stops still, then the handler puts the hound on to the scent at the 1st flag, and adds a “search” command this can be anything from go see, to go find, but it is always to be the same command. When the hound has come into sight and it’s clear the hound is “hunting ” the walker they should start to call the hound into them either by name or just by happy tones of good dog. Remember to praise the dog. Because foxhounds don’t have a breed club, if anyone who owns a foxhound is interested in tracking please contact your local working trails club. This is Travis at the ABB spring trails 2007 on the winning line of the day in the novice stake.